“Shop till you drop” is no more the smartest or even the kindest idea these days, with the Planet reeling under the mountainous weight of landfills and trash. But shopping is essential, at least for essentials like food and medicines! But when you shop, do you ever check the Maximum Retail Price (MRP) on the food, clothing, medicines or other things that you buy? There could be some real good consumer law violation out there, as a few consumers found out! Gerald Castelino of Mysore had gone to a liquor shop called True Spirits 2 in Kuvempunagar, Mysore where he bought a bottle of liquor for which he paid up Rs. 1,728. 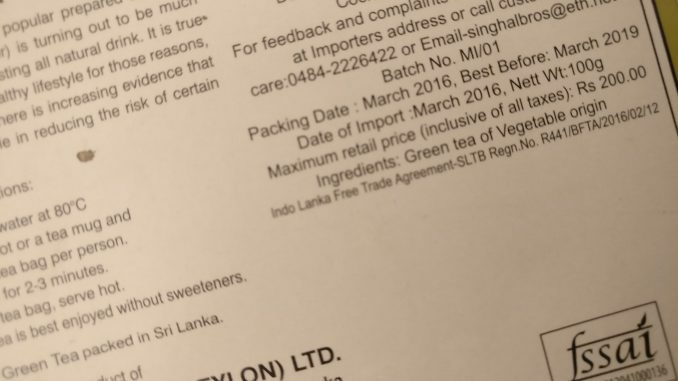 But on the bottle, MRP was marked as Rs. 1670. 61. He was charged Rs. 111.61 extra. When he complained, the shop’s proprietor and the staff told him that the stock on display was old stock and the new price was now applicable! Castelino complained to the Mysore Consumer Disputes Redressal Forum which sent a notice to True Spirits 2’s owner. The notice was ignored. Forum President H M Shivakumar Swamy in his order dated May 4, 2018, ruled that the shop and its owner were guilty of deficient service as well as unfair trade practice, as charging above the MRP is a very serious offense. He ordered them to refund Rs. 111.61 to Castelino along with a compensation of Rs. 10,000 and another Rs. 2000 as court costs! (Complaint no. CC/69/2018). If this order is not obeyed within a month, they will face imprisonment or a heavy fine. There was the case of a really persistent consumer called Thippireddy Krishna Reddy from Guntur district who had bought two bottles of Kinley soda water on January 18, 2018 from Valiveti Sudhakar owner of the Kirana & General Stores in Guntur. The shop keeper refused to give him a bill. But when he drank from it at home he suffered from severe nausea. He found that the bottle had an expiry date. It was manufactured on 27-06-2017! The shop keeper refused to give him a bill, or to return his money. So he complained to the Guntur district consumer forum. Its president sent a notice to the Kirana shop owner as well as to the Manager of Hindustan Coca-Cola Beverages Pvt. Ltd. Guntur District. They ignored the forum notice. The Forum President B Rama Rao in his court order dated 23-03-2018 (complaint no. 35 of 2018) ruled that both Valiveti Sudhakar of the Kirana and General Stores and the Manager, Hindustan Coca-Cola Beverages Pvt. Ltd. were guilty of deficient service and unfair trade practice. He ordered them to refund Rs. 2 collected above the MRP to Thippireddy Krishna Reddy along with Rs. 20,000 as compensation for the physical suffering and mental agony caused to him with Rs. 2,000 as costs within six weeks. Not satisfied, this unstoppable consumer took some more liquor shops to court for ignoring the MRP. He had bought a McDowel whisky from the Supriya Bar and Restaurant for Rs. 170 while the MRP for it was only Rs. 132.77. He took them to court where they claimed that this was not a consumer issue at all and the consumer forum should dismiss the complaint. The forum disagreed and ordered this bar to refund the extra Rs. 36.23 along with Rs. 1,000 as compensation and Rs. 1,000 for court costs. Urthota then complained against the Pavan Bar and Restaurant in Sirsi which took Rs. 165 from him though the MRP printed on the bottle was only Rs. 132.77. The lawyer for this bar told the court that the complaint was not maintainable. But the Forum President Mrs. Shobha CV found them guilty of unfair trade practice and causing harassment to the consumer and ordered them to refund Rs. 32.23 to him along with Rs. 2,000 as costs and compensation! Urthota told this forum that the bar owner had three bars in Sirsi and all of them were charging for liquor as they pleased, and cheating consumers. (CC/11/2017). In yet another case involving this bar (CC/16/2017) where he had bought a McDowel whisky, a BP whisky and one-litre water bottle from them, they charged him Rs. 280 for all products instead of the MRP of Rs. 225.46, an excess of Rs. 54.54 paise! This was at Pavan Bar and Restaurant in Yellapur road, Sirsi. The same forum ordered him to refund the excess amount along with Rs. 2,000 as costs and compensation! Will you now remember never to forget to check the MRP on the items in your shopping bag?